This is a homepage features our Mobile Nerf Party business and contact information. Our mobile NERF inflatable battlefield and NEW Laser Tag is perfect for your next Birthday Party, Church Youth Group, Family Gathering, or Corporate Team Building at your selected location. All the fun and excitement of "Paintball" without the bruises and mess. Now up to 60 players can participate! Perfect for ages 6 to 86 years of age! We promote Good Sportsmanship, Cooperation and Integrity through organized fun games and battles. NERF-themed parties are awesome, fun and safe! 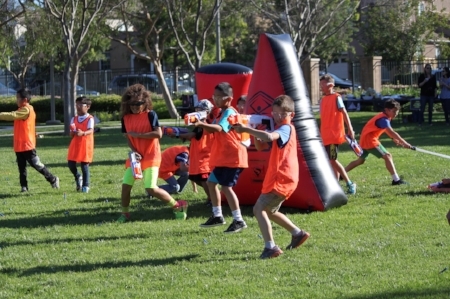 We offer a variety of packages and games/activities like- Capture the Flag, Shoot the VIP, Hit List, Elimination, Humans vs.Trolls, and many more games. Take your party to a whole new level with Nerf Party OC!